Anti-Israel activists manipulate the online encyclopedia. Wikipedia, the online encyclopedia anyone can edit, may strive for pure democracy, but that doesn't mean it's always fair. CAMERA learned this the hard way last month when their effort to fight anti-Israel bias on Wikipedia ended in several members being banned from the site and bad press for the organization. CAMERA's campaign involved recruiting volunteers and instructing them in the basics of Wikipedia participation. The Palestinian advocacy group, Electronic Intifada (EI), however, branded the effort "a plan to rewrite history" and filed a bitter complaint with Wikipedia administrators, resulting in unusually stiff penalties for the CAMERA volunteers involved. EI's chief evidence against CAMERA was a series of private e-mails exchanged by CAMERA staff and their volunteers. An EI staff member infiltrated the group and turned the e-mails over to Wikipedia, claiming they revealed a plot by CAMERA to manipulate Wikipedia and to pass off "crude propaganda as fact." An investigation followed, resulting in two indefinite bans and several shorter-term bans for CAMERA members. A closer look at Wikipedia's inner workings, however, reveals there is more to the story. Research carried out by Social Media expert Dr. Andre Oboler, a Legacy Heritage Fellow at NGO Monitor, reveals that it was EI, not CAMERA, that manipulated Wikipedia to achieve its ideological goals. Dr. Oboler also found that despite Wikipedia's clear policy against political advocacy, initiatives such as "Wiki Project Palestine" and the Yahoo group "Wikipedians for Palestine" used the Wikipedia platform to promote their ideological views, largely unopposed by the Wikipedia community. CAMERA, however, was singled out by the administrators in order to "send a strong message to lobbying groups, campaigns and other advocacy groups." With nearly 60 million visitors a month and 10 million entries in 253 languages, Wikipedia has become a primary resource for students across the world. A Google search for almost any topic will return a Wikipedia entry at or near the top of the list of results. But despite its popularity, Wikipedia does not always provide the most accurate information. What sets the encyclopedia apart from other sources is its reliance on the "wisdom of crowds" - allowing any user who spots an error in any entry to simply change it himself, anonymously if he chooses. Not surprisingly, this feature turns controversial topics such as "Jerusalem" or "Terrorism" into battlegrounds between people with sharply different agendas. To counter the problem, Wikipedia established the neutral point of view (NPOV) as one of its guiding principles. The NPOV policy is meant to ensure all sides are presented equally on a topic until a consensus eventually emerges, a process that can take many months of intense debate. At 14:08 on April 21 EI boasted publicly to someone thought to be a member of CAMERA's staff that CAMERA and its editor have been exposed. He links to the EI article about CAMERA [accusing CAMERA of a Wikipedia conspiracy]. At 14:26 the same person edits the CAMERA page making it say "CAMERA also attempts to use Wikipedia to covertly disseminate discredited pro-Israeli propaganda." They add that EI have e-mails that "outlined an attempt to subvert Wikipedia editorial controls and leadership structures" - an accusation designed to make Wikipedia editors see red. At 14:44 they edited the Wikipedia page on reliable sources adding "CAMERA cannot possibly be considered a reliable source" and again they outline their accusations. These edits appear aimed both to discredit CAMERA and to promote EI. It was clever marketing as well as clever advocacy, and it took under half an hour. [For the full transcripts of these edits see Dr. Oboler's research on Zionism on the Web]. But according to Dr. Oboler, EI's manipulations on Wikipedia pale in comparison to other pro-Palestinian groups such as "Wiki Project Palestine" - an effort supposedly aimed at improving articles related to Palestinian culture and society but misused to promote a political agenda, and the Yahoo group "Wikipedians for Palestine." 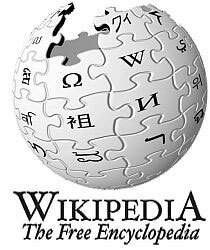 The real organized effort [to recruit outsiders to promote pro-Palestinian views on Wikipedia] appears to be from "Wikipedians for Palestine," a group that was advertised to individuals both on Wikipedia and through at least one Palestinian campaigning organization. That group was active for over two years. It was detected, questions were raised on and off Wikipedia, and then ...nothing seemed to happen, then or now. People commenting on the CAMERA case who were shown to be involved in this Palestinian group first proclaimed the group's innocence. Then they made a number of misleading claims off Wikipedia, stating, for example, that they "never recruited neophytes to edit Wikiepdia," and that their group is "independent and never bankrolled and backed by any organization, let alone one as well staffed and funded as CAMERA." They were challenged by an administrator to give access to their group so the archives could be checked, as was done to CAMERA. They promptly deleted the group - destroying all archives. Wikipedia apparently dropped the issue because no one had infiltrated the group or had evidence revealing the content of the deleted archives. According to Dr. Oboler, it is impossible to know exactly what it accomplished over the past two years. What is clear is that its claims on the group's home page were designed not only to defend themselves but also to attack CAMERA. The group may or may not have actually recruited people who were not editors, but they certainly tried to. The penalties to CAMERA are for trying to recruit people, not for any problematic editing on Wikipedia (itself a very unusual thing in a Wikiepdia investigation - normally only actions on Wikipedia are considered). Anti-Israel bias in Wikipedia takes three primary forms: vandalism, blatantly false allegations, and attempts to marginalize the Israeli perspective. Vandalism, such as efforts to change Jerusalem to 'Capital of Palestine,' tends to be relatively harmless. Editors discover these kinds of changes quickly and "revert" them to the 'community consensus'. Wikipedia allows editors to be notified by email if someone has changed a favorite entry. It also keeps a history of all changes, making it easy to restore the original content. A more insidious form of bias is the use of false information. An example can be seen on the 'Egypt' 'Camp David Accords' entry, where clear anti-Semitic incitement in the Egyptian press was dismissed as simple 'Anti-Zionist criticism'. This entry alone attracts 150,000 viewers a year, and the related 'Egypt' entry, which doesn't mention the issue at all, is viewed 3.5 million times annually. More common are attempts to marginalize Israeli and Zionist content and lend more weight to the Palestinian or Arab narrative. The entry "Massacres committed during the 1948 Arab-Israeli war," for example, lists only those allegedly committed by Jews. Another example is the original 'Hebrews' entry, which fails to mention the undisputed fact that Jews always prayed in Hebrew, and that it became their primary everyday language in Israel since the early 20th century. This category also includes entries that serve to diminish the perception of threats against Israel. For example, several Iran articles are apologetic about Iranian president Mahmoud Admadinejad's calls for erasing Israel from the map, reassuringly explaining the threat as mistranslation of Farsi, which supposedly only meant 'erase off the pages of time.' However they fail to mention that the same slogan was also painted on ballistic missiles in Iranian army parades. A WikiProject is a Wikipedia's community feature allowing people with common interests to collaborate on particular encyclopedia topics. A project's homepage is essentially a central billboard allowing users to share articles of interest with the Wikipedia community. 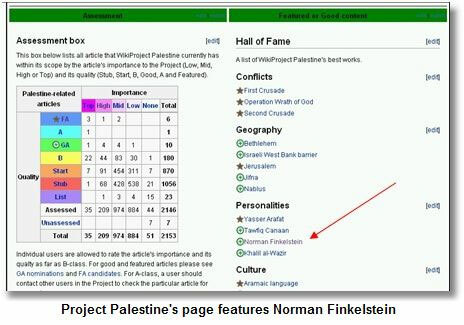 The 'Palestine Project' goals, stated on its page, fall within the accepted Wikipedia guidelines: To "Maintain information on Palestine including history, culture, geography and contemporary political, socio-economic and ideological context; Improve Palestine-related articles by expansion, verification and copyediting." And finally: "Be thorough and watch for POV in particularly controversial articles." Despite the warning, however, the actual content promoted by the project appears geared towards online advocacy. There are 210 articles marked as "high importance". About half are related to the Arab-Israeli conflict. Many appear because of their influence on public opinion on the Palestinian cause. In its hall of fame for best articles, the Palestine Project page lists four best biographies. One is by Norman Finkelstein, a staunch supporter of the Palestinian cause, whose controversial bestseller "The Holocaust Industry" accused Jews of exploiting the Holocaust for financial and political gain. There is also a large number of small articles that appear to have been posted to add weight to the Project's page, giving it the appearance of significant substance. Many of these articles are posted by anonymous users so that they will be difficult to track. This is particularly suspicious behavior considering the community-building nature of WikiProjects. According to Dr. Oboler, the entire project appears to be an organized effort to promote the Palestinian point of view on Wikipedia. 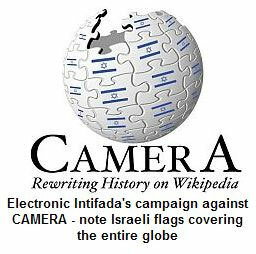 In trying to kill off an attempt by CAMERA to get pro-Israel people involved in Wikipedia, Electronic Intifada may just have thrown a spotlight on the real and far more successful campaign to control Wikipedia... the campaign that caused CAMERA so much concern in the first place. CAMERA was right about the problems on Wikipedia. People should consider getting involved in Wikipedia and making use of the resources they have (such as books) to improve the accuracy of articles they take an interest in (on any topic imaginable). The first goal must be to improve Wikipedia. That this helps reverse manipulation of the truth is one side effect. Good well-sourced arguments will not only expose mistakes, they will also make Wikipedia better. Editing Wikipedia is not hard and, in time, people will learn how it works and become part of the community. If you do want to get involved, pay attention to the policies, the five pillars and other information you will be shown when you join. If you run into problems there are plenty of people on Wikipedia more than happy to help or provide clarity about Wikipedia itself. The truth will win out, but someone needs to make sure it is heard, footnoted and properly sourced. Dr. Oboler is also a post-doctoral fellow in Political Science at Bar-Ilan University where he is researching online public diplomacy. This research covers Facebook, YouTube, Flickr, Google Earth and Wikipedia among others online platforms. More on his research can be seen at http://www.zionismontheweb.org/internet_warfare/ . HonestReporting, with 140,000 members, is the largest organization fighting media bias in the Middle East conflict. In 2006, HonestReporting launched Media Central, a Jerusalem center providing support services for foreign journalists in Israel and the region. Wiki cannot be trusted for authority. Please reference several works, especially on controversial subjects, and utilize as many points of view as possible to attempt objectivity. "Hacking" Wiki is done by both anti and philo-semitic groups, in order to "spin" the truth. As a social science professor each term's syllabus strongly stated that using/citing Wikipedia as a source was prohibited. The "wisdom of crowds" approach that Wikipedia proffers is highly suspect for its unreliability. Even more, we've seen the results of this "wisdom of crowds" in racist, anti-semite, and misogenistic societies, to name a few. A quick reply to David Cohen's comment above... it should not take articles in the press and reports by CAMERA to highlight specific instances of bias in Wikipedia. Articles once published (and correct at time of print) do not get altered and white washed as soon as those specific problems are corrected. There are plent more problems. Have a ready of the Jerusalem Report (the current issue which is dated July 7 2008) and you'll see another problem where an editor taking issue with my exposure of the Palestine campaign on Wikipedia went and removed all references to Zionism On The Web. Many of these were placed by Wikipedia admins, some were the basis of new Wikipedia articles on Jewish history, and some were linsk to primary source documents we host (historical content not available else where). Yet Wikipedia as a system doesn't seem to know how to deal with this damage, or perhaps it is just that various admins don't want to get involved?. Either way the system relies on people's honesty and continues to be broken as Palestinian advocates seek to exploit it. Wherever you look and whatever you do you can''t get away from the Arabs using all their wealth to deny, besmirch and try to destroy Zionism, feed people with hatred and lies and we the Jews having no rights in and for Israel as a free democratic country!! Let it be kown and repeated over and over again WE HAVE A RIGHT TO THIS LAND AND WE''RE HERE TO STAY !! The "common forms of anti-Israel bias" cited by CAMERA just do not pan out. Look at the articles yourself. For example, Wikipedia absolutely mentions the "Erase Israel" slogan on Iranian missiles, and it very clearly talks about anti-Semetic incitement in the Egyptian press in the "Camp David Accords" article, not dismissing this as "anti-Zionist criticism." While the "Massacres committed during the 1948 Israeli-Arab war" article only mentions killings of Palestinians, a separate entry on massacres BEFORE the war mentions a number of killings of Jews by Palestinians. Granted, the CAMERA article may have been accurate at the time the information was collected, and Wikipedia editors may have since fixed those entries (demonstrating that the wiki system does work), but that article has been floating around for a while now, and it should be updated if the organization hopes to maintain its credibility, especially when it is attacking the credibility of another widely used reference source. As a copy editor at a mid-sized Gannett daily newspaper, I''d just like to note that if one of our reporters ever cited Wikipedia as a source for background information, the story would be kicked back to them, and they would be told to do some real research on their topic. Why is CAMERA supporting anything that Norman Finkelstien says. Their just another witchhunt. And,cowards too. I will note them on ripoff-report. roomPoseurs,sit on your broom! Anyone who has ever looked under the hood at Wikipedia is aware of ongoing raging battles over anything to do with Jews, Israel and Zionism as well as the artificial ''Palestinian'' shadow-entity. Go to www.eretzyisroel.org for accurate documented information. Save Wikipedia from Palestinian terror attack! If Palestinians take a liking to Wikipedia ,then its political and ideological neutrality is over. Wikipedia is worth of a better destin. In the name of mankind, please keep them away of this common good! Dr. Oboler is "SHOMER ISRAEL" on the computer.